DigitalGov Search recently rolled out a new open source technology stack, which gives the team access to real-time analytics and dashboards to monitor search trends. 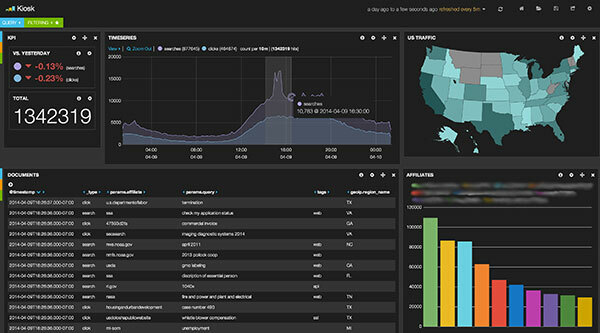 The ELK stack consists of Elasticsearch, a real-time search and analytics engine; Logstash, a log management tool; and Kibana, a data visualization engine for creating dashboards. The dashboard-building capabilities surface trends not seen otherwise when buried in the data, Ammie Farraj Feijoo, manager of DigitalGov Search said in a recent article in GCN. The team is now able to make quick sense of massive amounts of data to make decisions about which features to develop and how they’re developed. They’re also using the dashboards to notify agency customers when a query is trending and, based on that, agencies can promote or create new content to answer searchers’ questions. What’s next? The team is working on putting these dashboards in the hands of customers so that they, too, can quickly make sense of their agency’s search data and make decisions to improve searchers’ experience on their sites. Not a DigitalGov Search customer? Sign up and join the 1,500 government websites using the service to power their search box and improve customers’ search experience.